CUSTOM:EXCEL is an exhibition, showcase and celebration of the UK’s finest custom and modified bikes including: choppers, ‘bobbers’, streetfighters and cafe racers – and it’s all part of the outstanding Carole Nash MCN London Motorcycle Show at Excel from 15-17th February 2013. CUSTOM:EXCEL is a national event promoting engineering excellence and celebrating the wonderful world of custom and modified motorcycles and the fanatical culture that embraces it. Come and see the finest collection of custom bikes in Europe. CUSTOM:EXCEL - we’re talking everything from customisation, modification, individualisation and personalisation to improving, tweaking, tinkering, tuning, chopping, bobbing and adjusting! Thanks to Zodiac for sponsoring the Best in Show, Freestyle and Old School Chopper class prizes for the AMD World Championship of Custom Bike Building (UK Affiliate event at ExCeL 2013). Thanks also to 100% Biker for supplying all the trophies for the winning and placed builderIt’s all about changing the look, handling or performance of your existing ride or even your new ‘stock’ machine! It’s a grand get-together featuring the very best of British and European manufacturers, engineers, fabricators and craftsmen; whether they originate from a dealers’ custom workshop or an independent back street garage, we want to show off what’s out there and who’s building it. CUSTOM:EXCEL is an inspiration; an ideal opportunity to be part of a vast gathering of like-minded individuals embracing every aspect of ‘hard riding’ - from old school chops to stock specials. CUSTOM:EXCEL gives us the unique chance to admire the finest collection bikes and respect the most inspirational and radical builders in Europe. 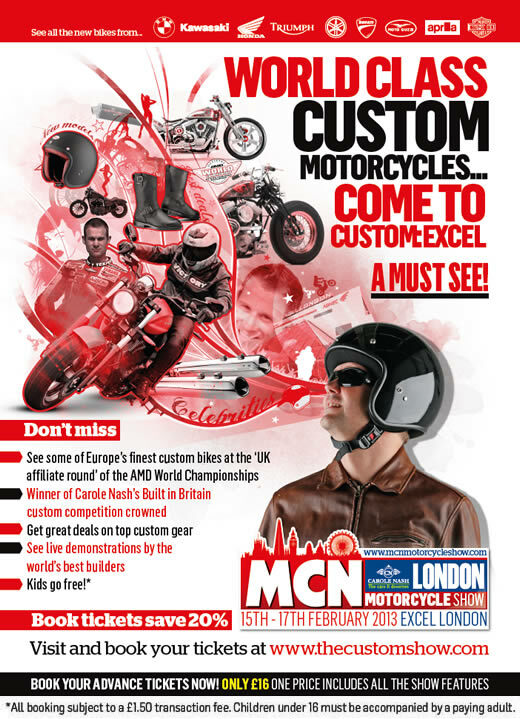 CUSTOM:EXCEL is an affiliate event to the AMD World Championship of Custom Bike Building, with the overall ‘Best in Show’ winning bike builder receiving fantastic prizes including a paid trip (bike shipping costs), complete with bike, to Essen in Germany for the World Championship finals!